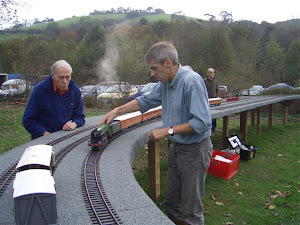 The Group was formed with the aim of building and operating a permament outdoor layout within the grounds of the Buckfastleigh station on the South Devon Railway. This has now been achieved, and regular meetings are held for the benefit of both ourselves, and also members of the general public who are visiting the site. Guests are very welcome - please make yourself known on arrival. Both narrow gauge and standard gauge scales are run, and both 32mm and 45mm gauge lines are available. Steam, clockwork, and battery electric powered locomotives are welcome. We have running meetings on the third Sunday of every month, plus the Sunday of any publicised special event taking place on the 'big railway' (please see the monthly list of dates posted in the main body of this site). Start time is usually mid morning, and we generally finish around 4.00pm. If the weather is bad (rain and/or high winds), please call first to ensure that the meeting is being held - see the 'contacts' section for telephone numbers. If travelling from a distance away, please call anyway! The Group holds public liability insurance cover, but individuals are responsible for insuring their own property against loss or damage (the Group bear no responsibility in this respect). The usual criteria apply, as laid down by the Association of 16mm NG Modellers and G1MRA, to boiler and pressure vessel certificates, which will need to be shown. Our permament outdoor 'exhibition type' layout is located in the grounds of Buckfastleigh station on the South Devon Railway (follow the brown tourist signs from the A38). It is in the 'garden' section, beside the main locomotive running shed. Free parking is available in the main station car park, and the overflow car park (if open) provides direct access to the layout area. There is a good cafe, and a model railway shop, on the site. The layout is a raised timber structure, providing three separate oval running lines of approximately 40m each. There is a dedicated steam raising area with an undercover 'refuge'. Peco track is used throughout, gauges are 32mm and 45mm, and all scale/gauge combinations can be accomodated. Note that there is no facility for track powered locomotives. There is no membership fee for the Group, but members and guests who run during a meeting are asked to making a contribution of £2 to help defray our costs. Each individual is also asked to 'sign in' and produce any relevant boiler certificates for inspection - this is a requirement of our insurance cover. Please remember that we are ambassadors of our hobby, and are effectively guests of the South Devon Railway. IMPORTANT NOTE: Part of our agreement with our 'landlords' is that running on the layout only takes place on the notified dates, or when a designated member of the Group (holding the necessary keys to remove the security covers) is on site. If no such individual is present, and the covers are padlocked in place, please do not run! Ignoring this request is very likely to lead to the Group being asked to vacate the site. First meeting, October 2006. Gauge 1 LNER A3 by Aster.